Wizard is the ultimate game of trump! A unique 60-card deck that includes the Wizard and Jester cards creates a challenging card game of trick taking. 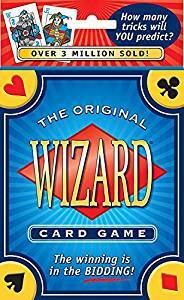 Wizard is a mix of hearts and whist with a twist, where the Wizard is the trump card and the Jester nulls any card it is played on. Place your bid on how many tricks you will take much like Hearts or Whist and start the round. The first round begins with just one card, the second two, and so on until the deck runs out.